300 Rise of an Empire is a worthy addition to your shelf--especially if 300 is already on it. In 2006, Zach Snyder showed us that even if he wasn't necessarily a genius innovator in terms of narratives (he does some of his best work with other people's properties), he was an innovative film-maker in terms of technique. His adaptation of Frank Miller's super-stylized (every page is a splash-page) 300--the story of the Greek battle at Thermopylae--was a stunner. Everything from the look of the images (unique color-saturation techniques, to the half-in-half-out bullet-time action) was visually arresting. The extreme-workout his actors went through produced chiseled, idealized Greek-god human forms (even if they had to airbrush some of the abs some of the time) and it was, in fact, something new. It also, however ahistorical it was, ended properly with the slaughter of the 300 Spartans at the hands of the massive Xerxes army. No one thought there was potential to make a sequel--until they did. 300 Rise of an Empire happens at the same time as the original 300 (some of the same days, even) but gives us the Athenian side of the conflict: the sea battle. Caped in contrasting blue (also not historical--but the movie gave us Spartan red), we get, again, a story told by the victors (in this case, brilliantly, Spartan Queen Gorgo which could explain, maybe, why she leads male warriors into battle--something that never actually happened) about one of the most important conflicts in western history. The movie takes us back to the pallet of 300 but gives us water--mostly computer generated--and ships (pretty realistic for the Spartans, completely imaginary for the Persians). We have a new hero in the form of the Athenian commander Themistocles (Sullivan Stapelton), the incredible Artemisia (Eva Green)--a real life female naval commander, and Lena Headey returning as Spartan queen Gorgo (yes, after "Gorgon"). It isn't realistic--but, hey, actual really-told Greek oral histories weren't necessarily realistic either--and while the movie makes up things they wouldn't have (Themistocles did not really kill Persian King Darius as the battle of Marathon, he died of disease), it gets some things right (the Greek naval strategies, more or less). The action is, again, fluid (and, this time, literally surrounded by fluid), bloody, and in-your-face. It uses the same techniques as 300 to be cut from the same cloth. They say in the extras that they "wondered" if 300 Rise of an Empire was a 'sequel, prequel, or equal'--they settled (of course) on 'equal.' While I liked it, I'm not sure if that's actually true: without 300, 300 Rise of an Empire wouldn't work especially well on its own from a narrative standpoint and I felt that while Sullivan wasn't bad, his Themistocles simply doesn't pack the same punch as Gerard's Leonidas. This isn't exactly Rise's fault: it's a worthy sequel and it does give us a wider view of a very important and interesting story (all the better for the parts that are historical)--but it's a sequel nonetheless. The Blu-ray is packed with extras. There are lengthy historical discussions as well as a lot of the "making of" (we see a lot of green screen, not surprisingly). We get input from historians, the director (Noam Murro) and Producers (including Zack and Deborah Snyder) as well as the actresses (Green and Headey). There are focuses on the real battle, women warriors, and the techniques and philosophy behind the movie. The DTS-HD Master Audio 7.1 is aggressive and you can hear the battle sounds as well as feel them. If you turn the sound up, it'll rattle your windows. The rear speaker is especially cranked puts you in the middle of the battles. The video is flawless--for a movie that trades on its visual impact, the 1080p picture doesn't disappoint. It's clear, sharp, and has no visual errors I could see at all--even getting up close. This is an absolute requirement for a movie like 300 and it delivers. If you want to see the contrast, look at the glowing gold like of Xerxe's "rebirth" against the obsidian black of his palace. Download 300: Rise Of An Empire from the iTunes Store in Digial HD. 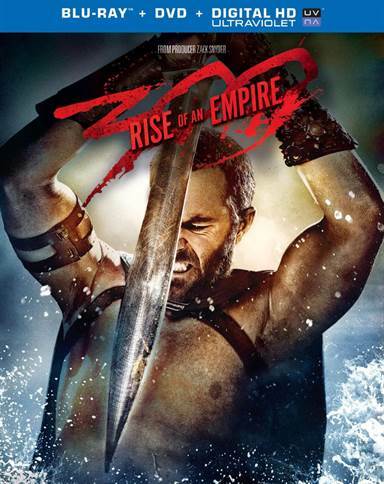 For more information about 300: Rise Of An Empire visit the FlickDirect Movie Database.